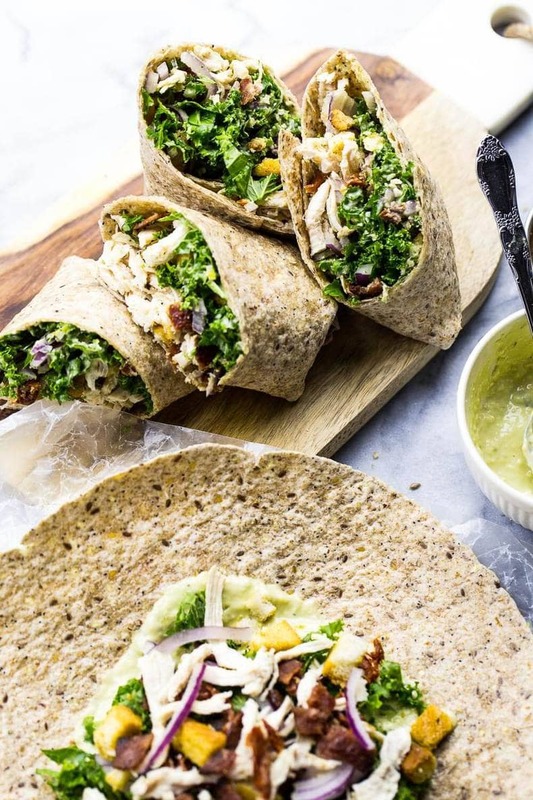 These veggie-filled Chicken and Kale Caesar Wraps are the perfect on-the-go lunch and include a lighter vegetarian avocado caesar dressing! This post is sponsored by Vitamix – thanks for supporting the brands that help keep my blog up and running! Let me tell you about my new favourite lunch wrap.? 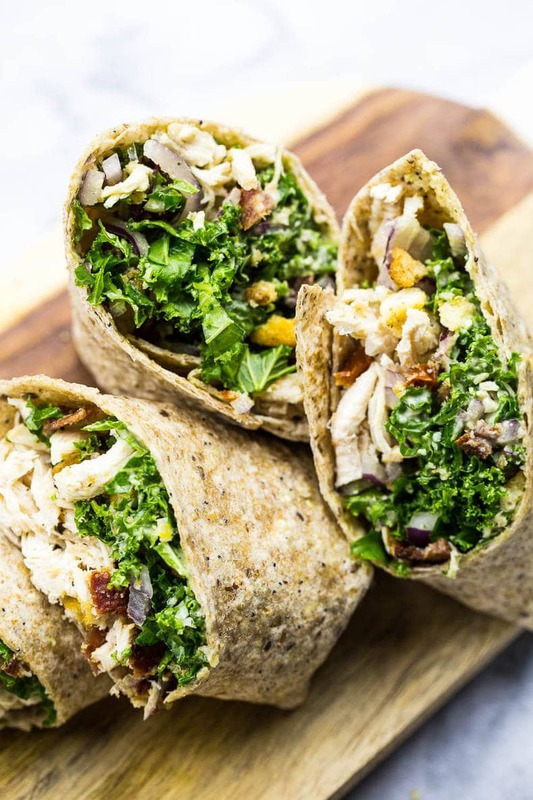 These Chicken and Kale Caesar Wraps are like health food on steroids. The kind of way you actually wanna eat your greens. Have I ever told you that kale is one of my very favourite vegetables? I honestly feel like the epitome of good health eating this stuff. I sometimes use it in my copy-cat cold-press juices when I need a little pick me up, and I just adore it chopped up in salads. In fact, I much prefer kale caesar salad to the regular version of caesar salad. I know, just crucify me right now. But give me a chance to defend myself first okay? There is something special about the way kale just soaks up this caesar salad dressing but still remains crunchy and texturous. And it lends itself nicely to other vegetable accompaniments like red onion and sundried tomatoes – there's such a vibrancy between these three flavours that you just don't get with a regular romaine caesar. Don't get me wrong, I really do love all things caesar salad. It is honestly one of my favourite salads (come on, side salads can't even compete! ), but kale just takes it up a notch. And I have officially included it in my buddha bowls wayyyyyyyy too many times. 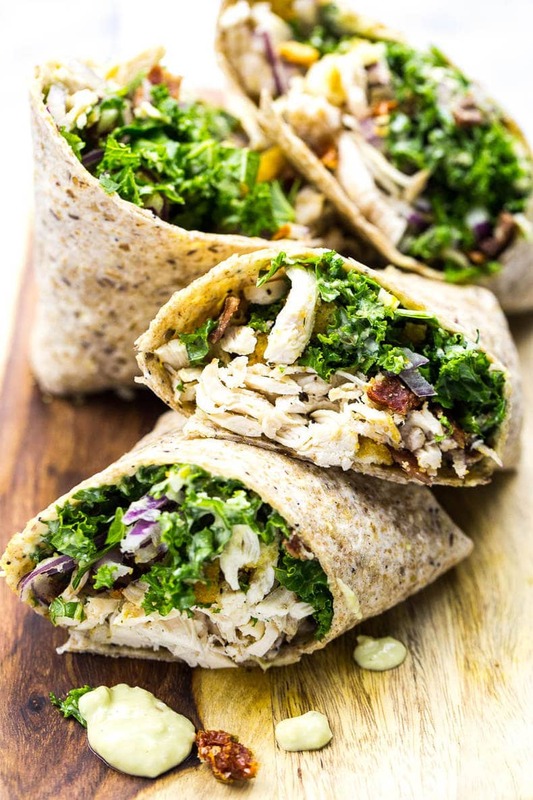 Make these Chicken and Kale Caesar Wraps just once and you'll see what I mean.? 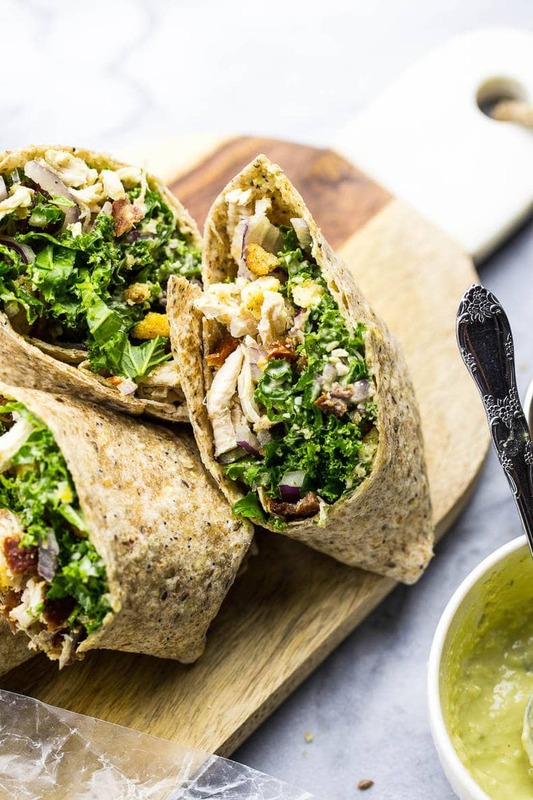 Get ready for a pile of shredded chicken (leftover rotisserie chicken works amazingly in this wrap btw just sayin'…), turkey bacon, chopped kale, avocado caesar dressing, thin-sliced red onions, sundried tomato, crunchy croutons and whole wheat wraps. There are so many delicious ingredients stuffed up in here that I bet you'll forget what you're eating is even healthy. That's really how I like all my meals. Unforgettable, incredible, low-cal and above all….DELICIOUS.? Yes, I'm tricking you into eating healthier, starting with the turkey bacon. 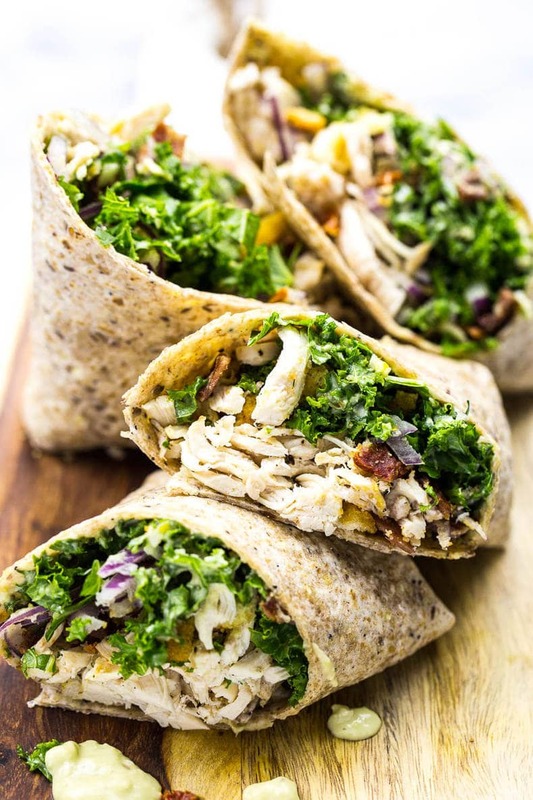 Please believe me when I say that it doesn't ruin in these Chicken and Kale Caesar wraps. But seriously, I can't believe we haven't talked more about the avocado dressing yet since it's my fave and I discovered it quite by accident in my quest to make a lower calorie homemade caesar dressing. And thanks to some light adaptation from my good friend Dana's recipe for vegetarian caesar dressing on her blog Killing Thyme, I was able to make this a vegetarian caesar dressing with a tiny bit of Dijon mustard and capers, so you don't have to open up a smelly can of anchovies.?? And if you're looking to avoid mayo I highly recommend you take a look at her vegetarian Greek yogurt based version of caesar dressing! It's made in my favourite Vitamix Ascent 3500!!! OMGGGGGGG is this an unbelievable blender. I seriously make ALL the soup in it, and it washes itself on its own washing cycle. And have I mentioned how many margaritas I've also made in it? The ice crushing capabilities people!!!! But I know, we're here for the Kale Caesar Wraps. And the avocado dressing. Let's leave margaritas til the weekend at least, shall we? Okay, now the only teensy tiny downside about this recipe is that the avocado caesar dressing doesn't last long – maybe about three days before it starts to not be too appetizing. That's what happens with avocado, folks. I mean, as an avocado lover you should already know this. But I figured I would put out a bit of a disclaimer anyway. So, you better get eating!!! 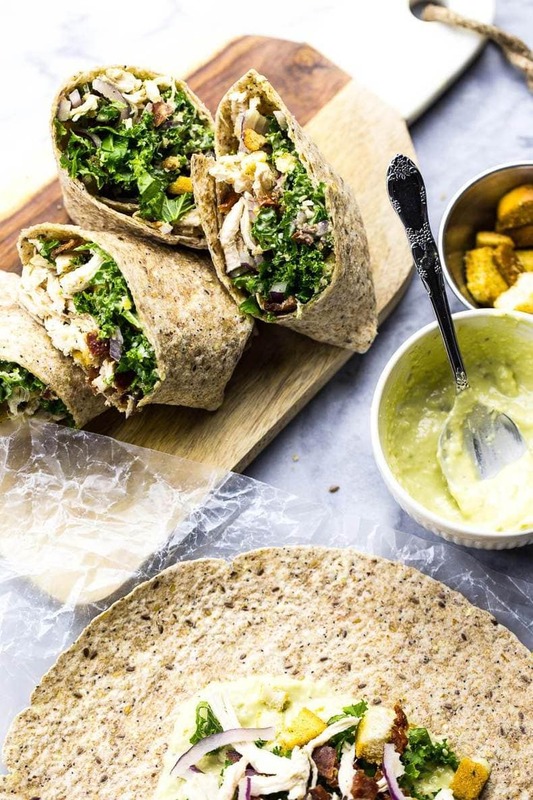 Will you be making these Chicken and Kale Caesar Wraps? What are some of your favourite on the go lunch recipes? Are you more of a bowl person or a wrap person? I'm kinda stuck these days on what I prefer. But seriously, the more lunch the better in general amirite? Add all caesar dressing ingredients In a Vitamix blender and blend on medium-high speed until well-mixed. Meanwhile, cook chicken in a large pot of boiling water for 15 min. Let cool and shred apart with two forks. At the same time, fry turkey bacon in pan on med-high heat for 5-7 min until well cooked. 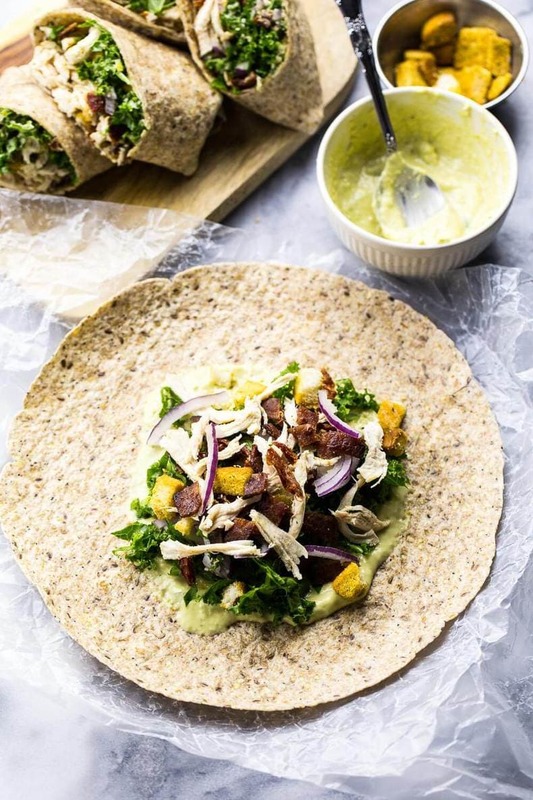 Spread avocado caesar dressing generously in the middle of each whole wheat wrap. Add kale, red onion, sundried tomato, chicken, turkey bacon, and croutons. Fold two edges of the wrap, then roll over with one of the free sides. Squeeze ingredients inside and roll up into a wrap. Cut in half and eat! Wraps up good to make the night before and eat within 24 hours as long as they stay in the fridge. Avocado dressing will last up to 3 days only in the fridge. Enjoy! Mmmm Caesar salad will always be my favorite! Love this lighter, healthier version. Looks scrumptious! I enjoy kale too, because I love the way it holds a dressing and doesn’t get soggy! 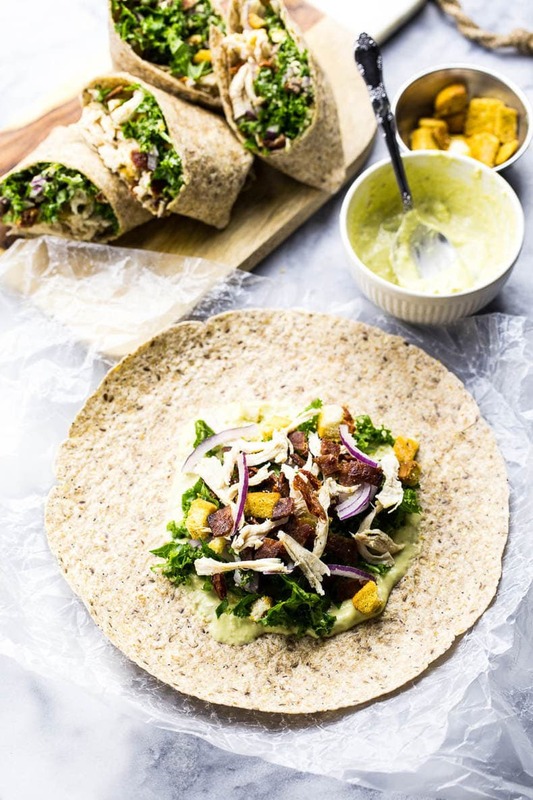 Your wraps look wonderful…I would love one for lunch! Thank you so much Michelle! 🙂 And yes, isn’t that the great thing about kale?! That wrap looks and sounds so good! Perfect to use leftover chicken too, and I love the addition of that creamy avocado sauce. MMmmm… I’m hungry! Thank you so much Gabby!!! 🙂 We constantly have leftover chicken laying around at our house so I’m always in search of ways to incorporate it into new meals!